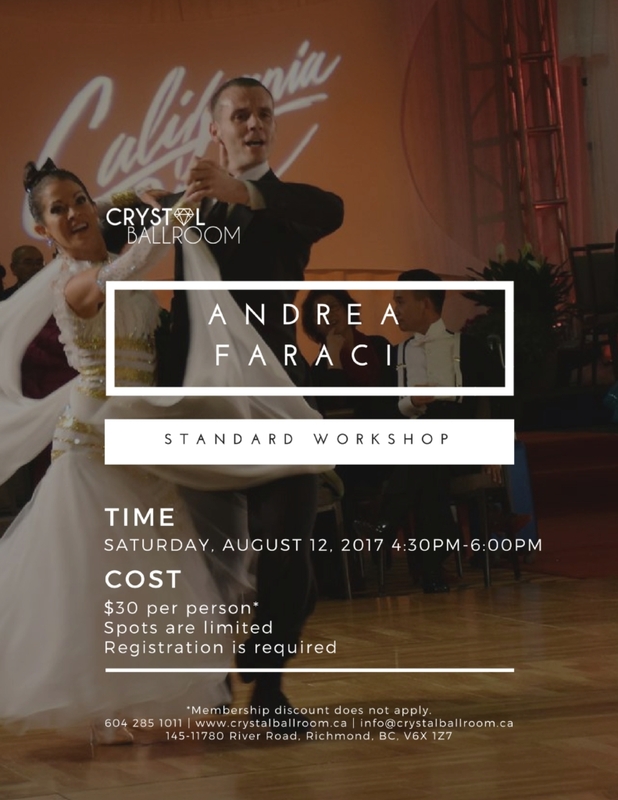 To continue our support for our thriving competitive ballroom community in Greater Vancouver, we’re excited to announce that U.S. Professional Rising Star Champion and U.S. Open Professional Finalist Andrea Faraci will be returning to Crystal Ballroom in August. He will be hosting a Standard Technique workshop this time, all levels are welcome! Spots are limited; you must register at our studio to claim a spot. Andrea has been a professional dancer and instructor for many years, having competed every year in his career and achieved a top 12 ranking at major international competitions like Blackpool. We hope to see you all there! Private lessons are also available from Aug 11-13, please contact our principal Zillion for details.